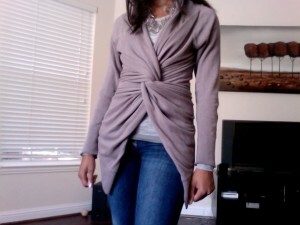 Wrap sweaters are a fun, versatile fall/winter piece of clothing. They come in every size and budget and chances are you already have one in your closet. I’ll show you 9 ways to wear it. Keep in mind that you can wear a dress, skirt, leggings, pants, jeans, etc. 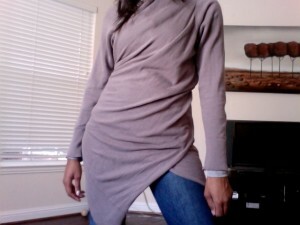 Secure the back of your wrap sweater to keep the material looking sleek instead of bulky. Throw it over your shoulder for a chic look. 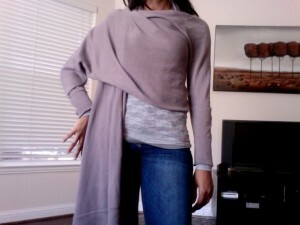 This wrap sweater is from Target (a few years ago) and this season I’m lusting after the ones at Victoria’s Secret. 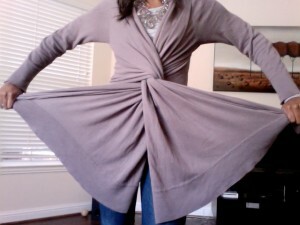 Always pay attention to balance when styling your wrap sweater. If you’re wearing it long and flowy, wearing a slimmer fitting bottom to avoid looking like a bag lady. 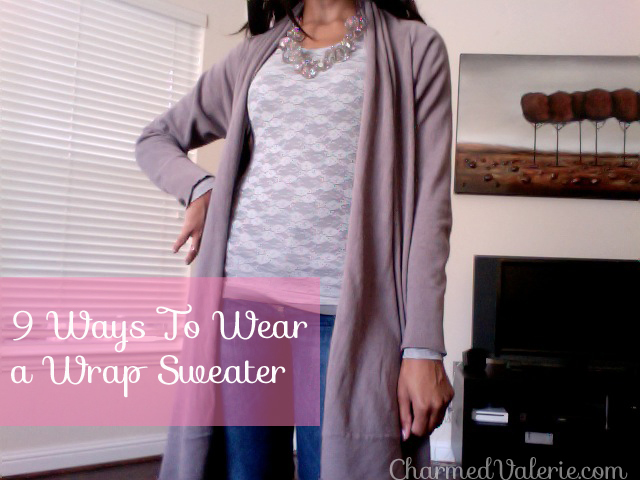 Do you own a wrap sweater? What is your favorite way to wear it? Are you tempted to buy one or wear yours a new way? Let me know in the comments. 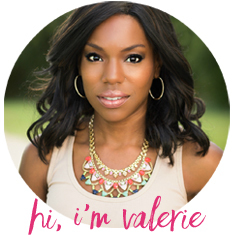 Valerie Rowekamp desires to live a stylish, soulful, charmed life while inspiring you to do the same. She's exceptionally resourceful, creative, passionate, and has been known to bust a move in the aisle of the grocery store. I think my mistake was buying a heavier weight wrap sweater and it made be feel too bulky every time I wrapped. I love how yours drapes and now I’ll be on the hunt for a lighter weight one. 🙂 Thanks, Valerie! Mine came with a silver hoop bracelet/ring. I have looped the two pieces through it and then tied the back instead of criss-crossing them. It adds a tiny fleck of pizazz. I can’t wait to try these out! Such a great idea! I’m stumped past 3! Ok. I have one of the Victoria’s Secret wrap sweaters in red. I bought it last year, but I never wore it because I wasn’t sure how to wear it. I’ve been trying to take more challenges with my wardrobe this year, so I have this thing on now. I really like the cross cross style, but try as I might, I can’t figure out how to get it to stay like that. What on earth am I doing wrong? @Kari – I just knotted it using the top corners. Is that what you’re doing? 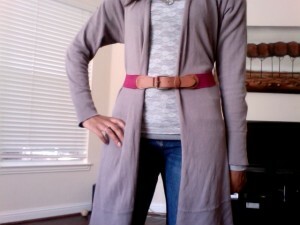 Here’s my attempt … I actually think that I like it with the belt the best. 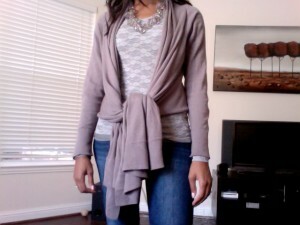 http://ladykchronicles.blogspot.com/2010/12/what-i-wore-week-of-december-13.html You have to scroll down. Welcome to my little piece of internet. I write and post videos about beauty, fashion, food, craftiness, family, adventures, and living an inspired life. Don’t Throw Away That “Empty” Mascara Yet!